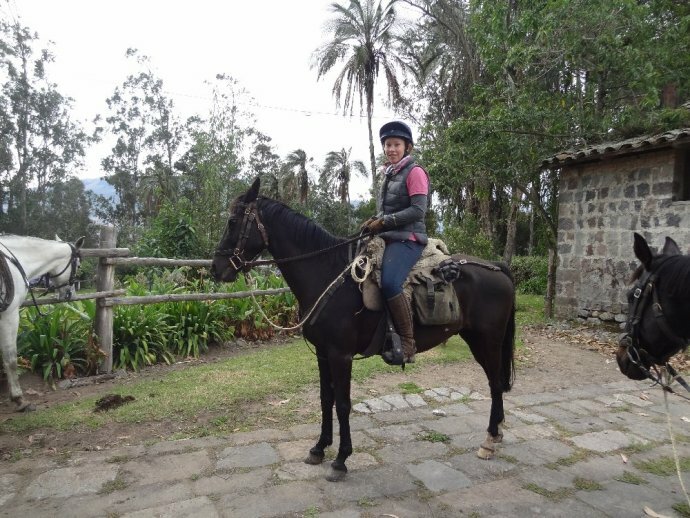 In September 2013 Abbie from In The Saddle was lucky enough to jet off to Ecuador on a three-week adventure. 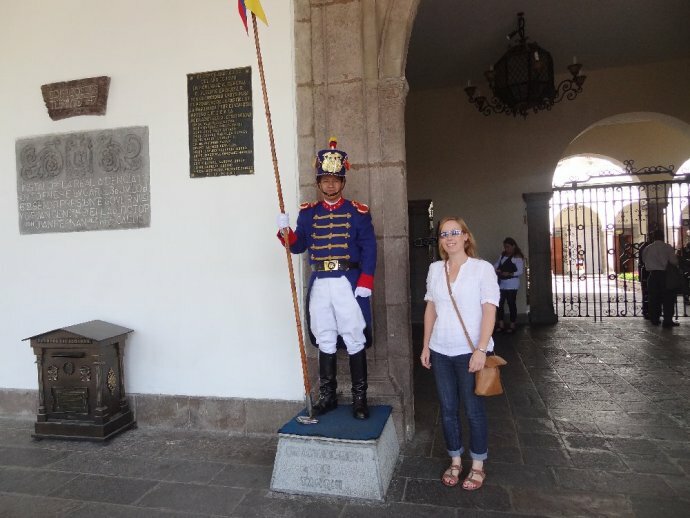 She began with a couple of days to explore the highlights of Quito, then joined the Colonial Hacienda ride. Next it would be off to the Galapagos for six days. Here is Abbie’s report from her trip. Landing at the new Quito airport, I was met by our ground handlers Metropolitan Touring. During the one and a half hour drive to Quito, I learnt a little of the city’s background. At 2,800 metres, Quito is the highest capital city in the world. Not only this, but it also houses one of the largest and best-preserved historic centres in the Americas. Quito was declared a World Heritage Site in UNESCO in the 1970’s, so there is plenty to see and do. Nestled in the country’s northern highlands, Quito lies on a plateau to the east of the Pichincha Volcano and is flanked by Cotopaxi, Antisana, Cayambe and Sincholagua volcanoes which you can see on a clear day. After a good rest I was collected the next day for a city tour. Wandering through the colonial town, we visited the impressive ‘La Compañía de Jesus’, a church which has Spanish, Moorish and indigenous influences, and a rather memorable golden interior. Others are less ornate, but no less impressive with huge carved wooden doors and the walls painted to look like they are made of marble! We also see the Archbishop’s Palace and the Cathedral. Later, we drive about 45 minutes outside of Quito to visit the ‘Middle of the World”. There are two options here and most visitors will choose to go to both. The first was constructed in 1982 and contains a monument, the Equator line and a museum about the indigenous ethnography of Ecuador. It has however been discovered that the actual equator is about 240 metres to the north! The other option is the Intiñan Solar Museum, which was built to mark the Equator. There are various exhibits on Ecuadorian culture, as well as demonstrations such as water flowing clockwise and anti-clockwise due to the Coriolis Effect. The next day it was an early start to travel to the new part of Quito for my transfer to the start of my riding trip. I met my fellow riders at Hotel Sebastian and Sally collected us promptly at 7:30am. We drove for about two hours north towards Otavalo, stopping just outside the town for fresh bizcochos, still warm from the oven, delicious! 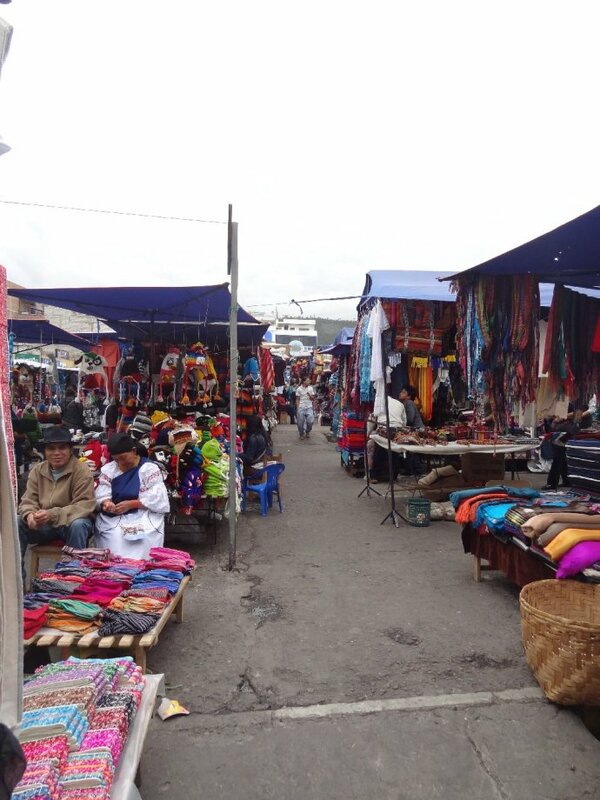 Continuing on to Otavalo, Sally gave us our bearings and then let us loose on the market! I liked the food section the best, so colourful with its stands selling Lima beans, maize and herbs, with the odd suckling pig or stall selling fried fish. There were many other goods to browse too, from colourful bolts of cloth in bright greens and pinks, to scarves, hats and of course the obligatory poncho. It was such great fun to wander around the market and see what is on offer; it is such a vibrant atmosphere and you can easily while away a few hours. After a few hours we were collected and it was a short drive of 10 minutes or so to Hacienda Pinsaqui. This first overnight stop was not far from the Pan-American Highway, although you would never know it by the time you are installed. Hacienda Pinsaqui is a wonderful building, well-furnished with interesting antiques. Our rooms were spacious guest rooms a short distance from the main hacienda, with views of the monkey-puzzle trees in the garden. We enjoyed a delicious lunch of potato soup (fresh cheese and a slice of avocado added just before the soup is poured into the bowl), and then fresh fruit salad of pineapple, papaya, apple with sorbet on top. Usually lunch would be a three course affair, but we were adjusting to the altitude and about to ride and so it was lighter fare than usual. Outside the horses were waiting for us, experienced Henry, dependable Antares, eye-catching Arab gelding Prince and handsome Cyrilo, among others. 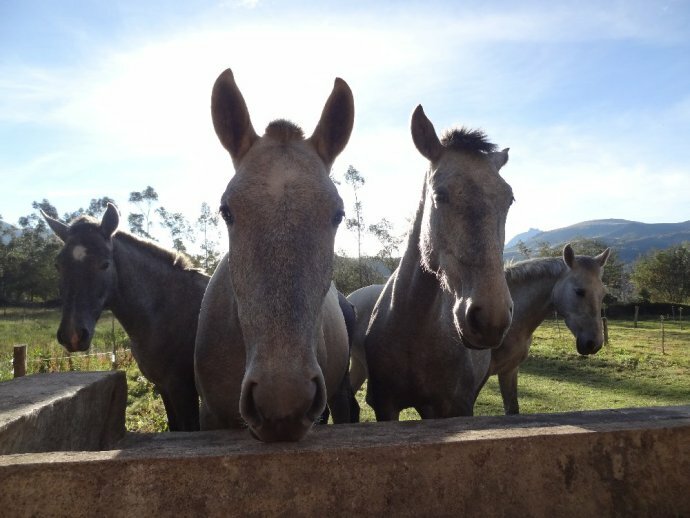 Sally’s horses are lovely looking, obviously cherished and very well taken care of. Our introductory ride took us across a small stream and out into the neighbouring community. Riding past fields of the biggest cabbages I’ve ever seen, we also saw small houses with smiling children playing outside and wonder at the impressive highland scenery surrounding us. Then followed three days of riding in the beautiful northern highlands, riding through villages, where the land is often worked by hand, the family’s cows and pigs tethered nearby. We journeyed through fragrant eucalyptus forests, past fields of lupins and potatoes with their purple flowers and saw a brand new foal born just minutes before our arrival. 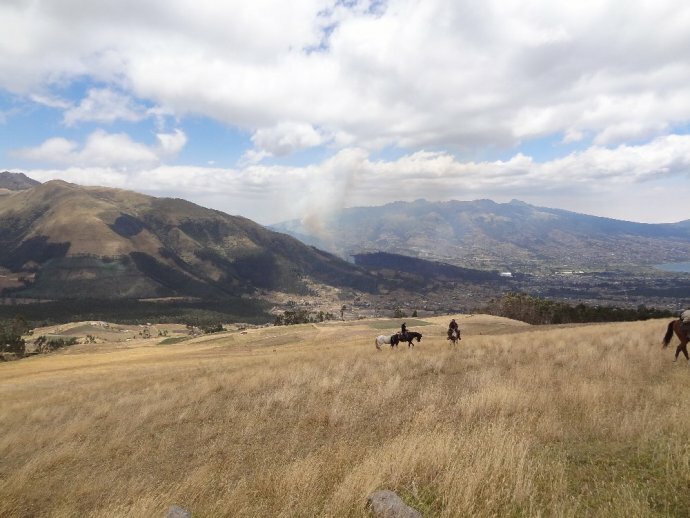 One of the best days of riding was travelling from Hacienda Cusin to La Merced. Climbing up into the hills and enjoying far reaching views of the farmland and villages below….it is extremely windy, but this only makes the day more exhilarating. We feasted on delicious and wholesome food; palm heart ceviche, quinoa soup, steak and local cheeses. At lunchtime we stopped for saddlebag picnics at a scenic spot and devour sandwiches invigorated with hot sauce, peanuts, three different kinds of passion fruit (one with insides resembling brains, but delicious), cheeses, ham and salami all washed down with coca tea and thimbles of warming vino tinto. Who told us that the altitude is supposed to reduce our appetites?! 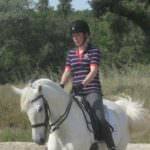 One of my favourite overnight stops was La Merced, home to beautiful Andalucian horses bred by Diane and Oswaldo. It was such great fun to wander down the avenue and meet the curious youngsters who peered over the fences at us, so keen for a scratch and a fuss. We visited the bullring and the chapel and just a bit further on, met the mares and their new foals. Before dinner we learnt something of the history of the hacienda and its breeding program. I loved the rooms with squeaky antique beds and stoves in the corner. After a delicious dinner we crept back to our rooms and delighted in finding our stoves lit and our rooms cosy and warm. Character and charm oozed from every part of the hacienda, from the old wooden floorboards, to the family pictures adorning the walls. Two days later we headed to our second riding location. 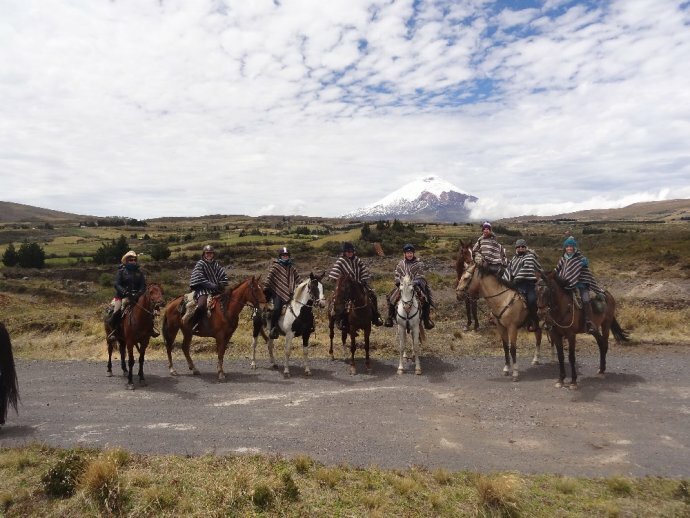 After meeting the horses on a rural track, we set off on a long and quite challenging ride in to Cotopaxi National Park. We made our way along steep hillsides (don’t look down! ), through gorse and finally up onto the paramo. 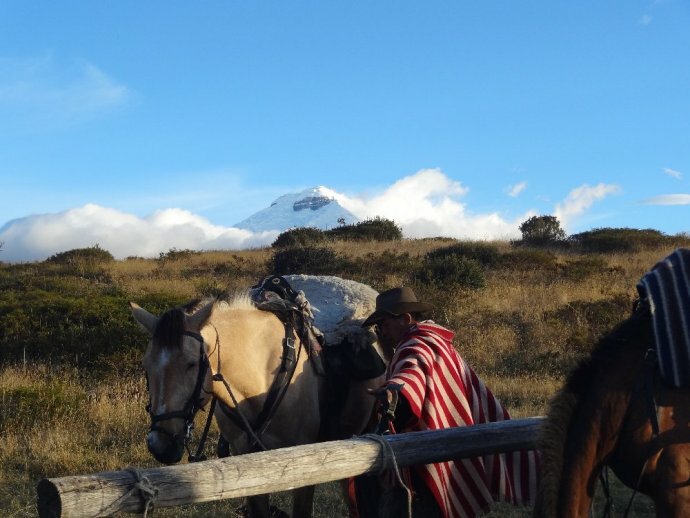 All those hours in the saddle were worth it for our first up-close glimpse of the impressive Cotopaxi volcano. Our overnight stop was the beautiful Los Mortiños, named for the wild blueberries found nearby. 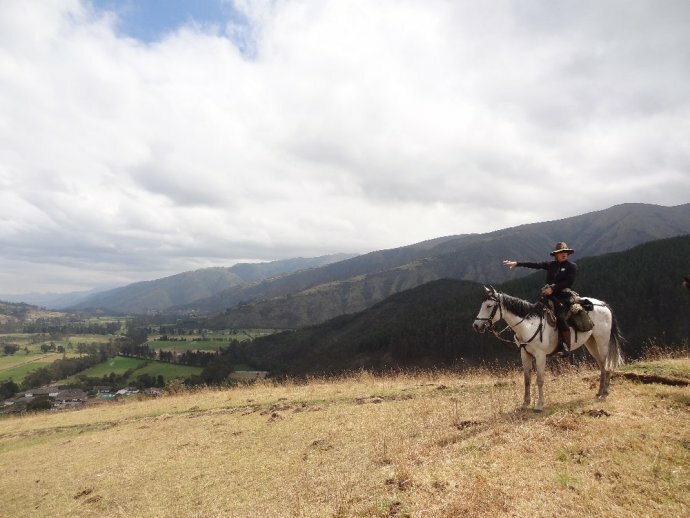 The next day we had the most exhilarating ride through the national park, with endless canters, pausing by a stream to catch our breath and climbing to the top of a ride to see an ancient Inca fort. 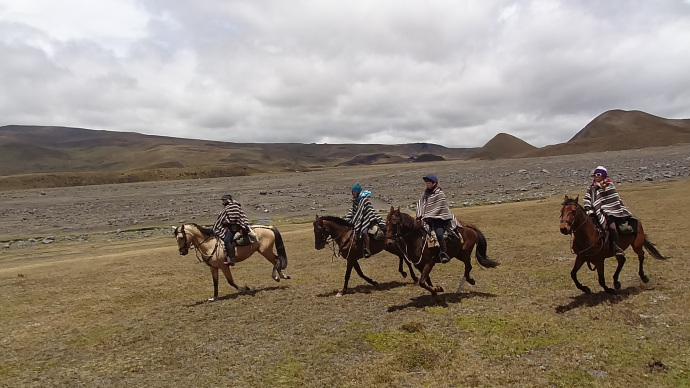 After lunch there were lots more canters, before stopping in at Tambopaxi Lodge for a warming cup of tea. Later, we were lucky enough to glimpse the wild horses, which stopped to stare at us but became timid if we got too close. What a wonderful day of exciting riding in truly the most awe-inspiring and exciting location I have ever been! The Colonial Hacienda ride has been an amazing adventure, full to the brim of expansive landscapes, rich history and great riding.